Music City Roots booth at the annual Recording Industry Career Fair. The Bragg Media and Entertainment Building’s Main Street was buzzing the morning of March 22 as a record number of music companies participated in the Department of Recording Industry’s annual Career Fair. 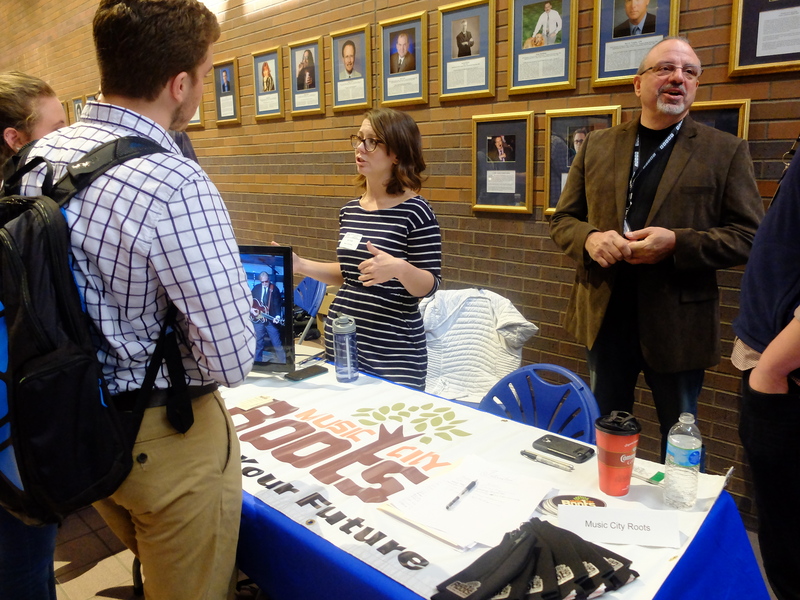 More than 30 company representatives from various segments of the music industry networked with students to explore employment and internship opportunities. The companies participating in this year’s career fair were: AristoMedia, Big Deal Music, Bluegrass Underground, Combustion Music, Compass Records, Crowdsurf, Do615, Event Systems Productions, HoriPro Entertainment, Huntsman Entertainment, Integrity Music, International Songwriting Competition, LMG Inc., Metro Parks Nashville, Mix 92.9 and JACK-FM, MTSU Career Development Center, Music City Roots, Music Pub Works/ZMG, Music Services, National Shows 2, Neste Event Marketing, Paragon Studios, Rocketown, Ryman Hospitality Properties, SESAC, SOLID, Sony/ATV Music Publishing, Station West, Ten Ten Music Group, The Collective, The Recording Academy, Trew Audio Inc., UMG Nashville, Vector Management, WMOT-FM, Words & Music, Copyright Administration and Workshop Management. 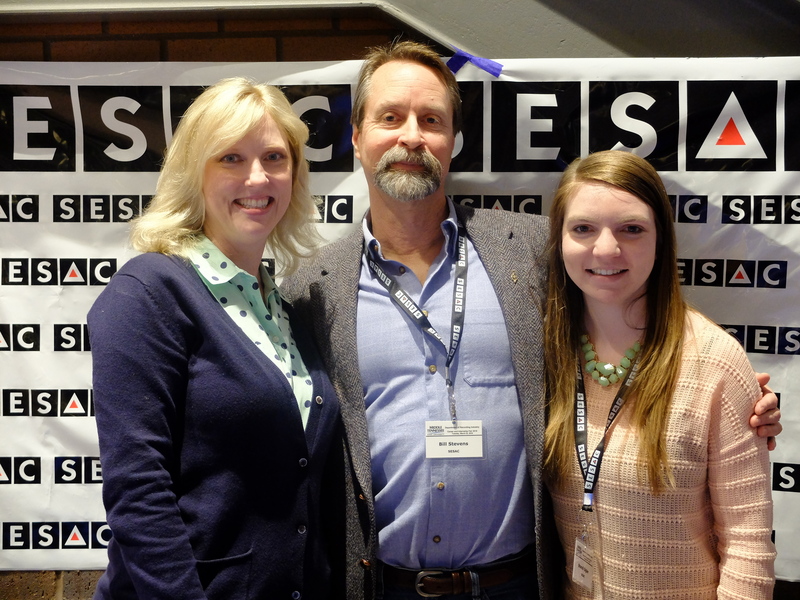 Recording Industry Chair Beverly Keel (left) with RI alumni Bill Stevens and Shandi Sigler manning the SESAC booth. In the afternoon, two information panels were held for students in Bragg 101. The Society of Leaders in Development (SOLID) presented “How to Navigate Internships” featuring industry experts Kristie Sloane of GreenRoom PR, Nathan Pyle of The Recording Academy, Halie Hampton of Maverick Management, Julian Wurpel of Agency for the Performing Arts and Rachel Cunningham of The Collective. The “Careers in Sound-For-Picture” panel highlighted mentors Nick Pallandino of NPALL Audio, Jon Jost of Digital Audio Post, Sarah Vorhees (independent), Jim Parker of CMT and Adam Ellis of TNDV. For more information about MTSU’s Recording Industry, click here.